We've received news that National History Day has posted an available position for Director of Programs. This position creates, directs and facilitates "all aspects of programming for teachers and students. This position reports to the executive director and is available as of September 1, 2013." Please go to this link for a job description and how to apply. "Issue 35 of our quarterly online journal features five leading scholars who consider how the role of the First Lady has developed: Betty Boyd Caroli begins the issue with a look at the First Ladies' Contributions to Political Issues and the National Welfare; Patricia Brady looks at how it all began with Martha Washington Creates the Role of First Lady; Catherine Allgor explains the way in which Dolley Madison: First Lady and Queen shaped the role of First Lady; Maurine Beasley describes the very politically active Eleanor Roosevelt as First Lady; and Gil Troy recounts the many unique actions of Betty Ford: A New Kind of First Lady. "Also included: lesson plans on this subject that align with Common Core Standards; an interactive map of the First Ladies and their birth places, featuring portraits courtesy of the Library of Congress Prints and Photographs Division and the National First Ladies' Library." For those interested in Hawaii's historical ties to the U.S. Civil War a unique online-based resource has been created at uscivilwarhawaii.blogspot.com. U.S. Civil War and Hawaii is listed with the Hawaii History Blog Project, a project-in-progress associated with the Hawaii Lyceum of History, a program started by History Education Hawaii, Inc. (HEH), the recognized state "council" of the National Council for History Education. "Our newest historical blog site, timed with the sesquicentennial observances of the U.S. Civil War around the country will, we hope, provide history teachers, students, historians and anyone with an interest in U.S. Civil War studies around the world a beneficial, all-purpose and convenient learning destination. Most all of the materials posted here now and in the future are centered around 19th century Hawaii-based perspectives on the war," said Jeffrey Bingham Mead, president of History Education Hawaii. At the time of the Civil War Hawaii was an independent kingdom with a substantial American community residing throughout the islands, with some -including Native Hawaiians- participating in battle. The kingdom was officially neutral in the conflict between North and South. Features of the blog site include word-search capability, language translation and the ability of users to post comments and questions under individual postings. The texts are being directly transcribed by volunteers from various 19th century Hawaii-based news sources. The blog site will be continuously updated. "Our hope," Mead continued, "is that this historical blog site like the others featured in the Hawaii History Blog Project will generate interest and discussion inside and outside of the classroom, promoting scholarship and capitalizing on the increased popularity of online access via portable handheld devices anywhere in the world. Our outreach is intended to be local and global." History Education Hawaii, Inc., is an independent, nonpartisan, nonprofit corporation serving the history learning community of the state of Hawaii. It is the official allied "council" of the National Council for History Education (NCHE), headquartered in College Park, Maryland. 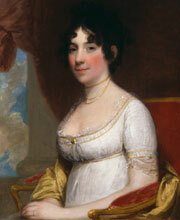 Last night C-SPAN broadcast a special program on the life and legacy of First Lady Dolley Madison. Did you miss it? No need to fret! Click this link to watch the full one hour and 30 minute presentation and panel discussion. From a Greek word to the Atlantic World, the new interim issue of Common-place (Vol. 13, no. 2.5) spans the globe. For all this and more, please visit the new interim issue of Common-place. No cost to participants, except travel to/from Providence, RI.